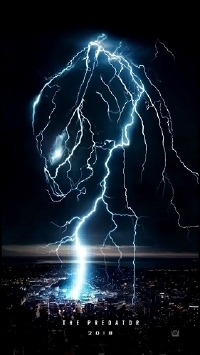 As someone who likes the Predator movies but isn't completely obsessed with them, I've been excited at the prospect of a reboot since it was announced that The Predator was coming from director Shane Black (less Iron Man Three, more Kiss Kiss Bang Bang and The Nice Guys) with a cast that includes Thomas Jane, Edward James Olmos, Keegan-Michael Key, Sterling K. Brown, Olivia Munn and Boyd Holbrook. Apparently set some years after the original movies, a kid (Jacob Tremblay) finds a box with some predator armour, accidentally triggers it causing the predators to return to Earth and only a crack team of mercenaries can protect humanity! I'm sure it's not quite so cheesy but the premise is pretty laughable. The teaser trailer is mostly lots of "woah" moments, witty one liners (Black's specialty) and a couple of quick looks at the universe's most brutal hunters but I did watch it three times, each time getting a little more excited - though I hope there's an explanation as to why a kid is opening a box with predator armour in it, and where did that box come from? We'll find out soon enough. The Predator opens September 14.